A little while ago, I made new character in a Marvel SAGA game I’ve been playing in. Without going into too many details about the system, I’ll say that you build characters with cards, and I really didn’t get the hand I wanted. 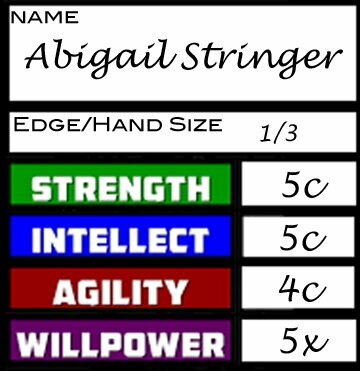 Eventually I put together Abigail Stringer (AKA “String Theory”). Her powers were “reality manipulation” and part of this (on purpose) was she was SUPREMELY AVERAGE. People forgot she was around becasue she blended in with the background. Her M.O. was to walk up behind people and hit them with something heavy—crude, but effective! The problem was I didn’t connect with the character. There wasn’t much time to role-play during the scenario, and since character creation depends on a random card draw I didn’t have the opportunity to figure out her background before I began playing her. The game was fun, but I was left feeling unsatisfied. Which led me to ponder: how can we, as players, better get into character? Stats alone don’t make a character. . . . Sometimes it’s handy to find an online character questionnaire and fill that out. There are massive ones and short ones, like those used to start games of Dread. If you do it in character it might help you even more. For example, if you’re playing a character who tends to lie about things, s/he might not answer the questions honestly—especially those questions whose answers might contain information that could be used against him/her. “Stealing characters” is another method. If you’re having a hard time relating to your character, pick someone from popular media that represents the archetype your PC would fall under. Are you playing a scholarly gentleman who perhaps wasn’t as scholarly in his youth? Take a look at how Rupert Giles handles himself. Are you aiming to be team leader? If you’re more serious, check out Nightwing from Young Justice; if you’re the good guy at heart but a bit silly otherwise, maybe you should emulate Monkey D. Luffy. Once you find a media character you can identify with, “study up” on them. Mimic their personality; borrow bits and pieces of it until you feel comfortable enough to develop your character’s own foibles and run with it from there. If you aren’t getting enough time in-game to role-play your character, and you find interacting with other characters helps you to develop yours, see if you can rope one of the other players or the GM into doing a short scene with you in person or via chat/email. Don’t try to do anything game-changing—especially if the GM isn’t there!—but do try and interact completely in-character. Discuss what’s recently happened in-game. Exchange character histories, as if your PCs were talking together at a bar. Hell, get into an in-character argument if need be. Do anything that’ll help you get a better feel for who your character is! So, I’m not sure that I’m alive. From there this little exercise went on to reveal to me that Abigail is a middle child and was pretty used to being ignored, but she slowly became aware something wasn’t quite right when she had to put real effort into being noticed all the time. She also realized some things weren’t quite right with the world around her. For instance, her room was too big to fit within the dimensions of her house. Doing this helped me flesh out the character so next time I have a better handle on how I want to play her. These are just some methods I know of or have used. There’s a comment box down there—use it! What have you done to get into character? Have you tried one of the methods above or something similar? What’s worked for you and what hasn’t? Was there ever a character you had a hard time connecting with? I love this article. I also love the fact that you were able to take a character you were feeling a little ‘meh’ about and give her some life. For me, getting into character sometimes hinges on figuring out how she (or in rare instances, he) talks. I don’t always mean accents, though, those can be fun if I’m comfortable doing the accent. More, how do they use language. Do they talk fast and bubbly? Do they express more with their face than their words? Do they speak formally or casually? I think if I can pin down something about the way the character talks, I can latch on fairly quickly. Heh. Aenaiyah & Val (two of my favorite characters) both have accents. Aenaiyah is British and Val speaks a female version of something between Inigo Montoya and Puss in Boots. I am terrible at accents, but I attempt them anyway if they make sense. Or, once in a while, if they don’t make sense… no-one ever did figure out why Paula had a British accent when she was shape-changed into an octopus. Myself included. I’ve tried those lists, but its all for naught. I need to play as a character for awhile before I figure out who they want to be. Its a very organic and not entirely conscious process for me. After a game session or two or three, it all comes gushing out of me and I can write dozens of pages of backstory. If I try to do it beforehand, it just doesn’t work. I never quite capture them and it feels very forced. Sometimes that’s just how the character goes–I’ve had one or two characters where the personality and background fleshed out as I played them. I consider Abigail to be one of those.